The Republic of Malta is located in the center of the Mediterranean Sea. The archipelago is formed of two main islands, Malta and Gozo, as well as Comino, are the only inhabited islands, and some smaller uninhabited islands named Cominotto, Filfla and St.Paul. Thanks to its position, Malta has represented a bridge between Africa and Europe since ancient times. The islands are in fact only 90 kms from Sicily and 290 from the African coast. 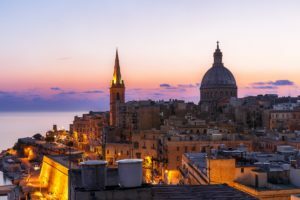 With a population of about 400,000 inhabitants and a surface area of 320 square kilometers, Malta has the highest density of population per square kilometers of any European country. There are plenty of opportunities in Malta for sports of any kind and activities for nature lovers such as walking and trekking, birdwatching, horse riding, rock climbing, windsurfing and several more.